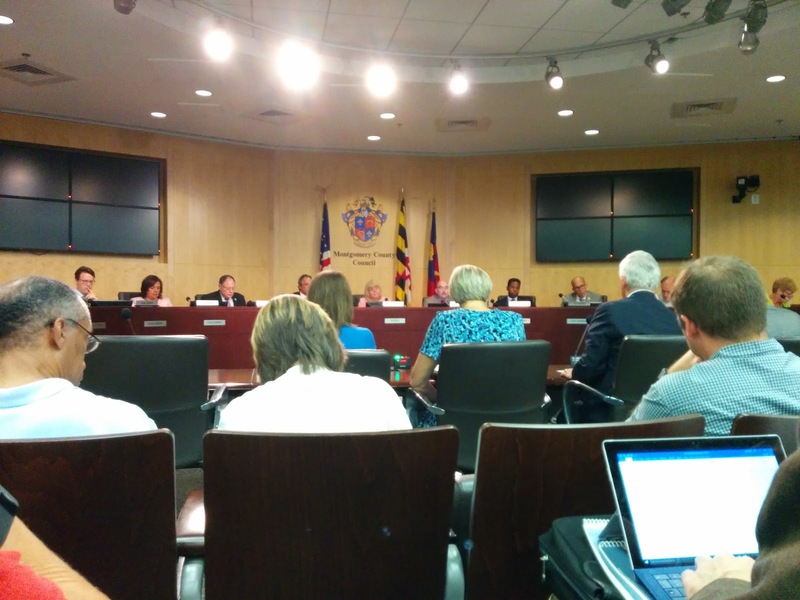 Last night there was a Montgomery County council meeting about the Subdivision Staging Policy (SSP) It was a chance for the public to comment on the planning board draft that was submitted to the council. The next steps are various committee meetings on aspects of the SSP. On Monday September 19th, Monday September 26 and Friday September 30 the Planning, Housing, and Economic Development (PHED) committee will meet on the SSP. The SSP provides the framework for development throughout the county. The intent of the Subdivision Staging Policy is to ensure adequate public facilities infrastructure, particularly schools and roads, associated with new development and growth. It sets impact taxes and fees related to infrastructure required to support new development. Every four years the SSP is reviewed and updated. 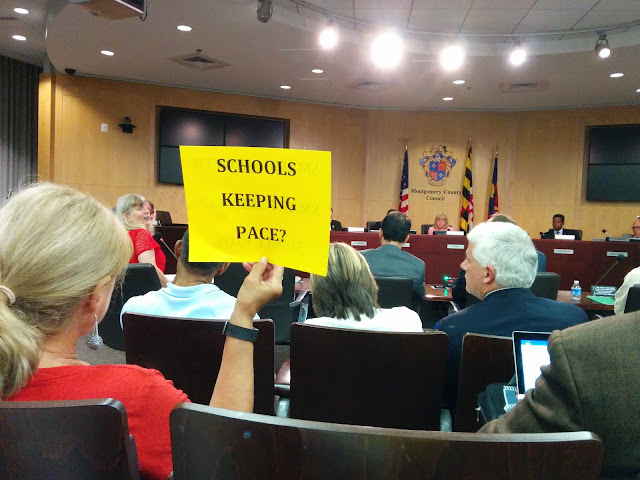 Public comments centred around a few areas of the SSP, primarily schools, transportation, metro station areas, and the Silver Spring former enterprise zone. The largest number of people testifying were commenting on the schools. These were primarily representatives of the various high school clusters and the PTA. They liked the changes in the SSP but didn't think it went far enough and think it should capture more of the cost of new school capacity for new development. The next were developers and representatives concerned about the treatment of former enterprise zones. Current treatment of enterprise zones and former enterprise zones is the same, they are excluded from impact taxes. The Planning Board is recommending that impact taxes be phased back in within former enterprise zones over four years (currently downtown Silver Spring is the only former enterprise zone in the county). Developers would prefer that the exemption of impact taxes remain, but, as a second choice would prefer that they are phased in over 4 years (the original recommendation was to phase them in over 2 years). There were also a number of people interested in the transportation aspects of the plan. Many were in favor of the changes which reduces the amount of parking at new development in high density areas, and eliminates the traffic tests in metro station areas. Some people however, thought the new focus on transit ignored the plight of the tens of thousands of road users and the impact of new development on them. The final group were from the areas surrounding downtown Bethesda. They want the traffic tests and impact taxes to remain in metro station areas (such as the Bethesda central business district) and point out that many of the new occupants will drive, emergency services will still be needed, and trucks will need to make deliveries to the new buildings. They also note that impact fees collected because of road congestion can be used to improve transit, walkability, and bicycle access.